Mysterious, rugged and imbued with a mix of Celtic wonder and Gallic charm, Brittany, the most westerly region of France is the sort of place that even the most experienced traveller will find inspiring, given the plethora of tradition and sheer natural beauty to be found here. All in all, it’s an enthralling concoction of stunning coastline (over 750 miles of it, about a third of France’s overall maritime frontier) ancient towns and castles (more than four thousand chateaux, manors and medieval homes) mysterious islands and inland woods. Given its close connection to the sea, it also goes without saying that the opportunities for fishing and almost every conceivable type of water sport are endless, yet inland the countryside is unspoilt and those archetypal French villages with their traditional cafes and restaurants seem to be ubiquitous. Brittany is also very much its own place. The people are proud and independent, so although it has been part of France since the 16th Century Brittany retains many unique traditions to this day, including its own language, known as Breton. In the age of the “mono-culture” it is so refreshing to come across regions such as Brittany which eschews blandness in favour of diversity and tradition and this alone makes it a place close to our hearts. But add to this an extremely hospitable people and a superbly varied cuisine (after all, this is considered the sea food capital of France) then any visit to Brittany should be a delightful experience. Particularly so when you see the accommodations we have for you. Are you looking for a manor house in Torcé or a hotel at the coast of Dinard? Choose from our selection of small, charming Brittany hotels and bed & breakfasts. 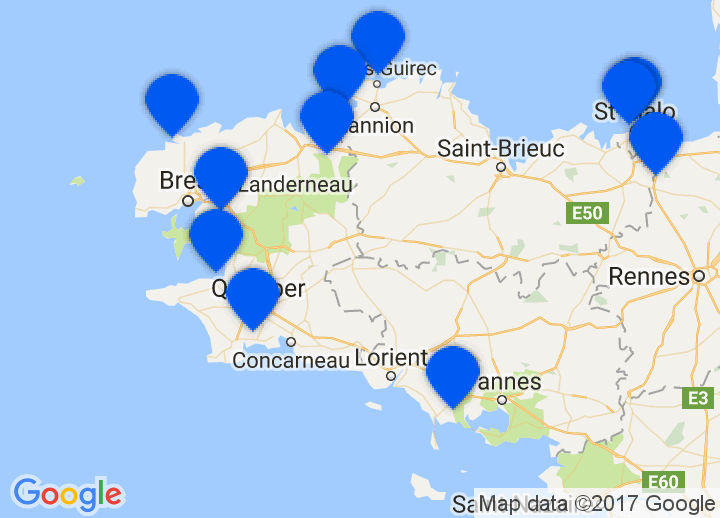 Finistère – literally meaning the “End of the World” - boasts the Iles d’Ouessant a a lovely group of small islands which make up part of the Parc Naturel Régional d' Armorique. Ille-et-Vilaine Eastern Brittany takes in St Malo an historic walled fortress located by the river and connected to the mainland by a causeway. Not too far off from here is the celebrated woods of Brocéliande an enormous ancient known not only for its natural beauty but also folklore of the legendary King Arthur. Morbihan lies in the south of Brittany and it's name means The “little sea” in Breton. It takes in the wonderful Mediaeval town of Vannes and if you want to explore this place, don’t use a car!. The cobbled streets and timber framed houses are simply made for being discovered on foot. Belle Isle, located off the the Morbihan Coast boasts being the largest of Britanny’s numerous islands. Cotes-d'Armor The northern region of Brittany is known for its rocky splendor, coastline, coves and sandy beaches. But that’s not all. Mediaeval towns spring up everywhere and surely one of the most beautiful is Dinan. Brittany’s history is a Celtic tale in the making, which in itself makes it a unique region in France. Yet like many other areas, its history has also been characterized by a struggle for autonomy, whether from the Romans, Normans, England or France. Initially part of The Roman Empire, having been conquered by Julius Caesar in 56 BC, the region became part of the province of Lugdunensis. Yet it actually received its modern name when it was settled by the Britons whom the Anglo-Saxons had driven away from Britain. By 1066, the boot was on the other foot, however, and Brittany was involved in the Norman Conquests of England. Indeed, the link to the British Isles has always been important. Brittany used to be known in English as Little Britain to distinguish it from Great Britain and even its national anthem is set to the same tune as the Welsh anthem. By the Middle Ages Brittany tried to keep its neutrality between France and Britain but by 1532 it had been absorbed into France following an unsuccessful rebellion. Brittany, however, has always had a nationalistic streak and by the 19th century, it was at it again trying to gain autonomy fuelled by the anticlericalism of the Third Republic. Even throughout some periods of the 20th Century, Nationalists made their voices heard. Activities With the temperatures that can reach 30 degrees in the summer months, views to die for and medieval towns and villages seemingly everywhere, Brittany is made for being explored.